A part-time cleaner has admitted stealing thousands from an "extremely vulnerable" dementia patient in her 90s. Audrey Hammond gave her card and Pin code to Lucy Bird, who did "odd jobs" around her home in Cambridgeshire, to withdraw cash. But "gambling addict" Bird kept most for herself, pocketing between about £21,000 and £27,000, a court heard. 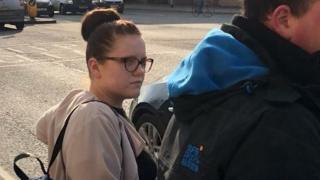 Bird, 21, pleaded guilty to theft and will be sentenced on 9 May. Cambridge Crown Court was told that Bird began doing jobs such as cleaning and cooking at Ms Hammond's home in Warboys in 2013. She was paid about £10 an hour, working about two hours a week. Bird would sign the reception's register under a different name, the court heard. Prosecutor Daniel Wright said Ms Hammond's dementia meant she was "totally unaware of this crime". Ms Hammond's daughter said Bird had been a "trusted" figure, and called her actions "unforgiveable". "To abuse vulnerable people in this way is beyond reprehensible," she said. Stephen Kennedy, defending, said that Bird was prepared to pay voluntary compensation to Ms Hammond and called it an "opportunistic crime". Mr Kennedy said that the thefts had been used to fuel Bird's gambling addiction, although she had not gambled since her arrest. "There is remorse... and there are steps taken to deal with the addiction that has led to the behaviour," he said. Bird, of Rampley Lane, Little Paxton, was warned by Judge Jonathan Cooper she may face a custodial sentence.